I’ve been back from Burning Man 2013 for a couple weeks now and I’ve succeeded in the sometimes-painful reintegration of myself into the default world. Anthrolume was, ultimately, built for Burning Man, so of course I had a great time wearing it again, meeting hundreds of people, and showing off the newest features, which I’ll talk about here. 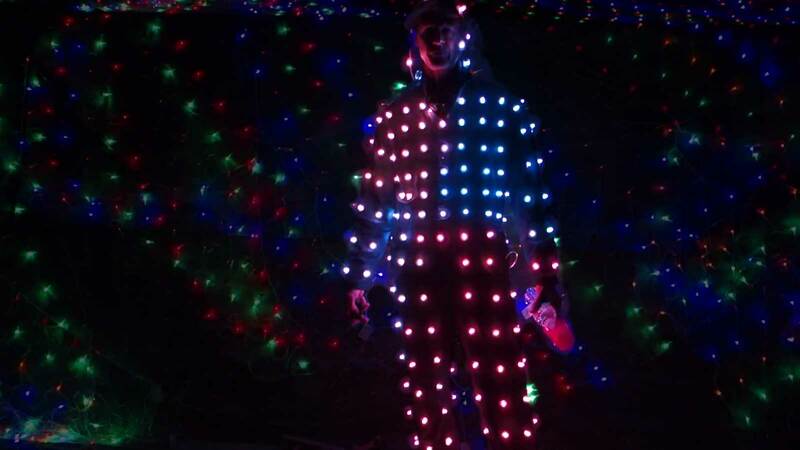 The suit still draws a great deal of attention, even though there are plenty of people out there now wearing a lot of LEDs. On top of that, I made the suit able to transmit beats to my campmates via XBee radio. My suit sends simple commands to the rest of them to change to new colors/patterns every beat, along with other simple commands such as blacking out their suits. It’s pretty effective, as can be seen in the video below, but next year I’ll make my suit do the same simplified things as theirs so we all look the same. Another big feature this year that I added at the last minute is called “Guest mode.” Basically I created a tab in my Android phone app that I can hand to people on the playa and just let them control my suit directly. Here’s what the phone app looks like. A guest can drag their finger around the hue wheel to change my suit’s color in real time as they drag. If they tap the middle of the wheel, The suit changes to lots of random colors. 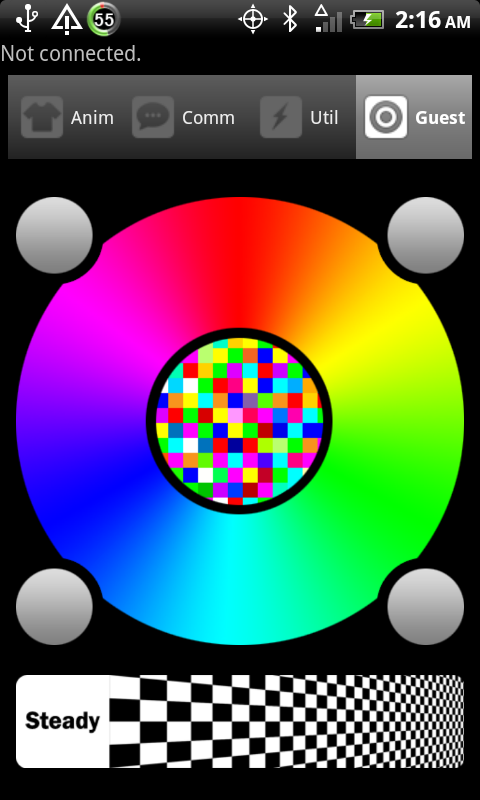 The four lobes on the hue wheel run various random animations. And the slider on the bottom makes the suit flash, the flash rate increasing as the guest drags to the right. The interface is deliberately unadorned with text or instructions – it invites experimentation. On top of that, my suit can retransmit this guest input to the other people in my camp. Here’s a short clip of someone on an art car controlling me and my campmates all at once with my phone. And as always it was great fun being out with my other heavily-LEDed Prismaticamp campmates. Here’s a little of us all together.